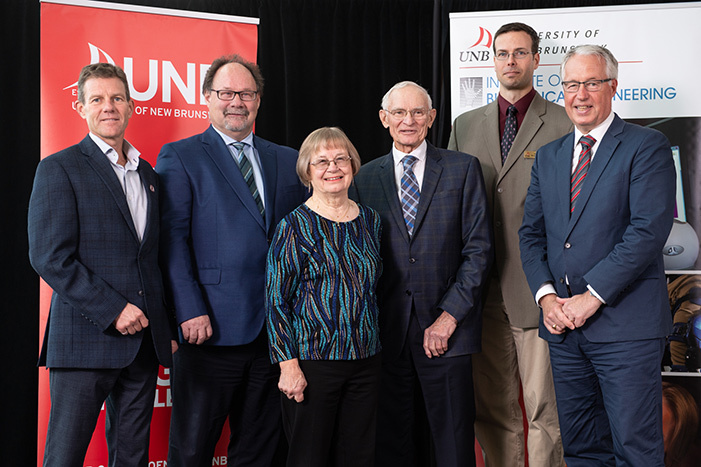 The Institute of Biomedical Engineering (IBME) at UNB will be adding new space for the Centre for Adaptive Rehabilitation Engineering thanks to the generosity of alumnus Bob Pickett (BSc CE '61, MSc CE '63) and his wife, Barbara. The Picketts' leadership gift of $400,000 has leveraged $4.5 million from the Province of New Brunswick and the Canada Foundation for Innovation. This funding will be used to construct a new wing at R.N. Scott Hall and to purchase the technology that will support world-class research. Acting Director of IBME Dr. Jon Sensinger says that the new research facility will allow UNB researchers to take neurological rehabilitation to the next level, helping to better understand how the human brain repairs itself and adapts in order to restore function to the body following traumatic injury or disease. "This will be a state-of-the-art facility equipped with a virtual reality lab, a mobility lab, and a fully-instrumented daily living lab, which is a mock home with kitchen, bathroom, bedroom and other common spaces," said Dr. Sensinger. "These lab spaces will be supported by robotic equipment, such as an overhead-mounted zero gravity system, to provide support for patients who cannot fully stand under their own power. And because the zero gravity system is highly adjustable, it will enable rehabilitation programs to be tailored to the needs of individual patients." Bob and Barbara Pickett were first inspired to support IBME when they attended a research symposium during UNB's Homecoming a few years ago. Bob's aunt lost an arm and a leg due to an accident in her youth, and the Institute's work on prostheses and physical rehabilitation made him think of what would have been possible if she had had access to today's technology and rehabilitation services. When the Picketts learned that IBME was planning an expansion project contingent upon government funds being bolstered by gifts from private donors, they knew that this was the right place to invest. "Rehabilitation is something that means a great deal to both of us, and we are pleased to support a world-class initiative right here in our province," said Bob Pickett. UNB President and Vice-Chancellor Eddy Campbell applauded the Pickett's gift and the centre that it will support. "This facility will serve as a research centre where therapists and biomedical engineers can study ways of optimizing recovery programs for people with brain injuries," said Dr. Campbell. "These innovations will help transform how rehabilitation is delivered in New Brunswick and lower the health-care costs associated with the province's aging population. We are grateful for Bob and Barbara Pickett's support for this project." Bob Pickett holds both bachelor's and master's degrees in civil engineering from UNB and Barbara is a graduate of the New Brunswick Teacher's College (now part of UNB) and taught school in Fredericton in her early years. Mr. and Mrs. Pickett have supported a number of initiatives at UNB in the past, including scholarships. In recognition of the pivotal role that the Picketts have played in the creation of the Centre for Adaptive Rehabilitation Engineering, the new wing that will house the centre will be named after them. About IBME The Institute of Biomedical Engineering (IBME) is a world renowned, multi-disciplinary research unit that was founded at UNB in 1965. It houses a celebrated research clinic focused exclusively on upper-limb prosthetics, where faculty members have developed bionic arms and hands that respond to leading-edge human-machine interfaces. It is also a global leader in the development of technologies that help people with brain injuries overcome challenges to mobility, strength and dexterity. Photo: Dr. Kevin Englehart, Acting Associate Dean of Graduate Studies; Dr. David MaGee, Vice-President (Research); Barbara Pickett; Bob Pickett (BSc CE '61, MSc CE '63); Dr. Jon Sensinger, Acting Director of the Institute of Biomedical Engineering; Bob Skillen, Vice-President (Advancement).